For my entire adult life I have been looking for ideas, programs, gadgets, people, customs, practices to make the aging process better for the residents of Aegis. With the opening of each Aegis building we try to perfect our programs and practices. 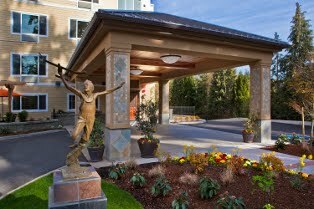 On Feb. 15, the latest Aegis community, Aegis of Bellevue in Washington. I am just giddy about the opening because it comes with so many unique things that we have never done before but I think will so improve the quality of the lives for those who choose to live there. The location is amazing with a public park as our front yard, to the north are some of the best eateries in greater Seattle within a 3 minute walk. The water lies just two blocks away and a playground for children is right on our property. One of the leading malls in the country, Bellevue Square is two blocks away. We are truly in one of the finest neighborhoods in the country. We bought the site and the design that was originally a condo project, so since it was permitted we didn’t have much design influence on how the buildings shell looked. But we did have a lot of influence on the interiors and the common space. Have you ever heard of a senior housing project with an Apothecary in it? How about a 1951 Cadillac in it’s courtyard, an herb garden that was designed by an herbalist with all eatable plants, or a theater that really looks like a theater, with a Marquee and popcorn popping. The artwork was masterfully done by Nina Zingale, a nationally recognized artist and art consultant. Much attention was given to our special needs residents, with some art being done by Alzheimer’s residents themselves. Local artists from the Puget Sound area were also featured. A little boy with an airplane sculpture graces the front lawn. The art is absolutely smashing. The exercise equipment is the latest equipment with Technogym being featured throughout. The equipment was chosen to minimize strain for residents while maximizing strength and cardio fitness. There is a crafts room, a demonstration kitchen, a history wall, a massage room, a card room, a computer room, library, private dining and much much more. But it is the detail and thought that has gone into this property that will distinguish it from others. For instance the life enhancing light therapy program which has special lighting to assist those with dementia and depression and to help energize residents will be new to our entire industry. The memory care community has tactile art and cuing art that is brand new and helps improve cognitive degeneration. The community has Dr. Claudia Finkelstein, senior faculty member with the UW School of Medicine on staff. The building is misted with an aromatherapy ventilation system that assists creating a calming environment without being obvious. This is not your great-grandmothers retirement home. It is meant to be a place where people come to live, not to die. Wow Dwayne, that last quote just inspired me so much as an Aegis employee (our Bellevue community is SO awesome by the way!). I hadn't ever heard it framed like that before. Thanks for keeping grounded and CARING.